The Miliaraki Vineyard House lies at a beautiful location, lush with vineyards, and welcomes wine and nature lovers for a unique experience of fun and relaxation, just 20 minutes from Heraklion and 10 minutes from Miliarakis’ Winery. In one of the most beautiful wine making belts of Crete, at the peak of a small hill, we have created a venue where you can taste all wines produced at the winery, and accompany them with Cretan cheeses, uncork a bottle of wine of your choice, have a coffee or a soft drink, and enjoy a refreshing ice cream, enjoying a view of Crete’s enchantingly wild nature and the serene landscape of the surrounding vineyards and sunflower fields. You can also wander through the vineyard, hike in the neighbouring forest, where the Byzantine church of St. Mamas is located, and, if you have the necessary equipment, climb down the two neighbouring ravines. In Vineyard House, at a fully-organized shop, you can buy company wine, pure virgin olive oil, Cretan honey, aromatic plants and herbs, various types of soap and make up products based on olive oil. 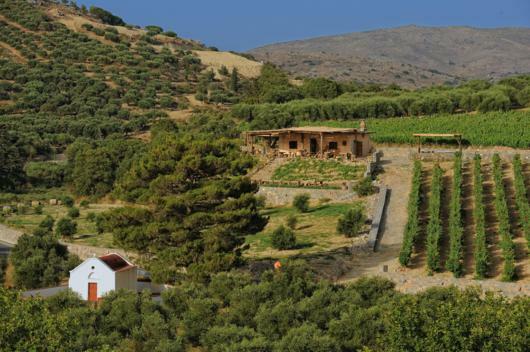 The Miliaraki Vineyard House is located in Saba, Heraklion, 28 km south-east of Heraklion. According to some indications, the village of Saba has existed since approximately 400 B.C., when it was named Thenai or Sylos and used by Knossos as a military base. In 69 B.C. Thenai was sacked by the Romans, who set up an observation post at Vigla and their command post at Komes. In 860 A.D. the city was sacked by the Arabs, in 961 it fell into the hands of the Byzantines and in 1400 it passed to the Venetians, who used it as a fortress. In 1657 the Ottomans took over Saba a until the liberation of Crete. The name Saba is considered to be of Turkish origin and means “early morning”.